I knew the key to having a successful blog was to create an email list. This was my number one focus when I started Women Winning Online. Email subscribers are loyal and will visit your blog. They will buy your products. They will join your Facebook groups. Yet when I started blogging I was getting about 5 subscribers a month. I was sad. I used to get 54 subscribers in one week with my old blog! I knew I had to make a change to grow my email list. 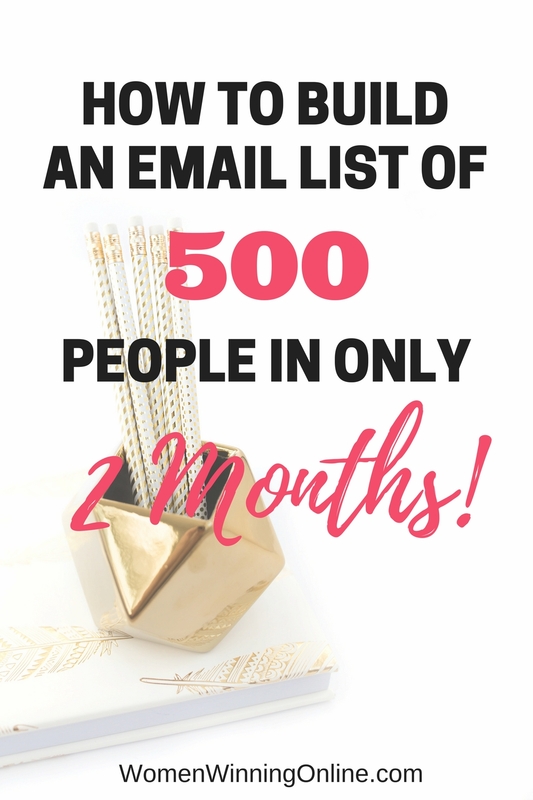 Here is what I did to add 500 people to my email list in only two months. The first thing I did to grow my email list is I made it a priority. What you focus on will grow. I was too busy focusing on social media and even blogging. I had to get serious about my email list. I had to actively participate in making it grow. In April I decided to make my email list a priority even over blogging. I stopped writing my blog, put up a landing page, and went out there to collect email addresses. When I first launched my blog my lead magnet freebie was a list of 29 things you need to do before your blog goes viral. Good, but not setting off any bells and whistles either. I went back to the drawing board. I went into Facebook groups and looked at the questions bloggers were asking. I kept seeing people ask about what to send after someone subscribed to their list. They had no idea. Well even though I wasn’t blogging I was still sending out emails. I had about 150 people on my list at the time. My unsubscribe rate was less than 1%. Unheard of with email newsletters. I knew I was doing something right and even better I knew I could teach it. I stayed up late one night and crafted 10 Step Worksheet to Create the Perfect Email People Want to Read. Once I had what I believed to be the perfect opt-in offer I created a pretty landing page to show it off. I didn’t overdo it or over think it. I use Thrive Landing Pages and I used one of their awesome templates to create my landing page. I wanted to set up a landing page because I wasn’t actively writing on my blog. I made this page my home page. I then set off to promote my new freebie. You know how in Facebook groups you can share your latest blog posts or freebies on promo days? I went crazy with this! I shared my email worksheet in about 15 Facebook groups over the course of two months. I never, ever shared a blog post. Only my email worksheet. The result? 422 people signed up for my list using this promo tactic. In only two months! This is a strategy that paid off for me big time. Yes I could have sent them to a few blog posts I had published and they could have signed up for my list using the sidebar widget. But this was a crap shoot. I had a better shot of sending them to my landing page and having them sign up. In addition to Facebook groups I also shared my post on Twitter and on Pinterest. This didn’t drive as much traffic for me as it wasn’t my main focus. I was finding more luck in Facebook groups than I was Pinterest and Twitter. Using Pinterest and Twitter I had 78 more people sign up for my email list. For not focusing too hard on that strategy I was happy with the 78 new subscribers! Know Your Niche: I think the one unspoken thing that I did during this process was I got to know my niche. I researched them. I studied their questions. Then I created a plan to help them. I got to know them and provided value. This paid off big time plus I had the bonus of helping people which I love to do. Make it a Priority: The next thing is I made my email list a priority. I didn’t worry about social media, heck I didn’t even worry about blogging. I just focused on growing my list, knowing that if I did, my blog would grow too. Make it Look Good: I then put everything together in a pretty package with my opt-in offer and my landing page. I wanted people to feel like they were getting something valuable for free. I didn’t just throw together a Word doc and put it on a boring page on my website. I made it look good and I put it on a page who’s only goal was to convert my visitors into email subscribers. Promote, Promote, Promote: Then I promoted the heck out of it! I did promos in 15 Facebook groups week after week. I would read Facebook posts about email marketing and offer my advice, plus my newsletter where appropriate. I never let up on promoting my email list! If you are serious about blogging and building your tribe, you must build your email list first. This list will be your loyal following. They will read your posts and share them. They will buy your products. Get to know your niche. Offer them something for free they can’t pass up. Put it behind a landing page and then promote the heck out of it! 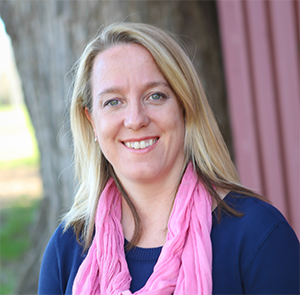 Before you know it you will be like me and have a thriving email list of over 500 people! What are your thoughts about building an email list? Do you have one or is this something you are still working on? Is this a hard task for you? Please share your thoughts in the comments below. Thank you for taking the time to comment! That is an awesome strategy! My blog is almost a month and a half old. I am hoping to hit 300 subscribers by the end of month two. 500 is inspiring! McKinzie thank you for commenting! That is so exciting that your blog has almost hit 300! The first 100 are hardest to get I think. Please keep me posted on how it goes for you! Thank you for the tips! My goal is to get an email sign-up option on the blog this weekend, so this will be very helpful! Yay! You are welcome! I hope that you are able to get that accomplished for your blog. It changes everything when your email list starts to grow! Awesome post. I have added landing page to my to do list. I so enjoy your emails. they are always filled with useful information for the new blogger. The best way to start is offer a freebie that your readers want to learn more about. Solve a problem they are facing and give it to them in exchange for their email address. That is what really helped me grow my email list! If you ever want to chat about it please let me know! This is awesome – thanks for the tips I’m off to implement some of those ideas!! Woo hoo Tammy! Please keep me posted on how it goes for you! Thanks for the post, Jen! I am also struggling with creating an email list of subscribers. I will follow each and every step mentioned above to build my email list. My first step would be to create a rocking opt-in. Your blog is awesome. You are welcome Sireesha! I am so glad this post helped you! Landing pages have been game changers for my blog. I highly recommend them. Thank you! I am so glad you are in the group with us! This is my goal in the next 30 days! Thank you for the advice! You are welcome! Promote that list like crazy and you will get there! Great tips, am actually working on creating a more targeted opt in report as well. Thanks! That’s great Sue! I hope this helps you grow your email list too! Jen this is a great list! I always struggle with sharing my opt-in or my blog post in Facebook promo posts. I want new subscribers, but I also want to share my latest work! Thank you so much Rachyl! I am a fan of getting people on my list so I can share the posts over and over with them. Thank you for your comment! I wished I had realised sooner how vitally important an email list is. I didn’t really get serious about mine until 12 months after I started my blog. Since then it’s been a whirlwind! Love your tips! I know! An email list is so important and people really don’t realize it. But that’s great that you are rocking your email list– congratulations! These are great tips! I’ll be putting a few into action for sure. Oh I am glad Renee! Good luck growing your list! Thanks so much Jenni! I am a big fan of having an email list. I love connecting with people over email. It’s been really rewarding for me! This is a really nice article about building email list. You know? 500 people 2 month isn’t easy cake for bloggers and especially if they’re newbie to blogging. I’m now working on enhance my email list too. I have create 3 capture pages, but not ready promo the pages. What’s more, I plan to create 20 capture pages for collecting email as I understood the more capture pages, the more optin rate. Thanks for sharing, I have nothing to comment about the post, but it’s awesome. Thank you so much Kimsea! I know building an email list when you are just starting out definitely isn’t easy. But I find what you focus on grows! I hope this helps you get more people on your email list. Thank you for the comment! Jen, absolutely LOVED your post…I have an email list from a different market, and I’m growing it with the Pinterest crowd (whom I love). Thank you for this awe-inspiring information! You rock! I appreciate your kind words! That is a good way to grow your email list. Thank you for commenting! I’ve just created my first opt-in freebie it’s a Blog Post Optimisation Guide), set up a landing page and downloaded Find Your Tribe online so focusing on my Pinterest strategy right now. Will let you know how it goes! Thanks for the tips! You’re welcome and congratulations! It sounds like you are on a roll! I am excited for your progress and look forward to hearing updates. Thank you for commenting! May I just say this is the first blog post I have read that actually seems realistic. I started my blog about a month ago, I have no subscribers yet. Is it possible to build a list after you have launched? I am seriously struggling in this area. Can I create a landing page after I have launched as well? Thank you for these great tips. I will be using some of these for sure! Hi Audria thank you for your comment! Thank you for your kind words about this post! Congratulations on starting your blog! That’s so exciting! Yes, it is possible to start an email list right from the start and create a landing page too. In fact I did that without even blogging. It’s about finding out where your people are hanging out online, and then promoting your landing page and freebie there. It is absolutely doable when you first start! I think building your email list is one of the most important things you can do when you start a blog. Your subscribers will be your most loyal readers! Thank you so much for this info. I am going to put the landing page to work…once I figure out how to make one 😉 And start creating my tribe. LOVE your site, I will be back again as I continue to grow our site. So glad to hear you found this post and blog helpful! To help you create a landing page, I would direct you to the tutorial I wrote: https://womenwinningonline.com/create-landing-page-thrive/. Feel free to contact me if I can be of further assistance and thank you for commenting! Thanks for this post! I’ve been wondering about how and when to create an opt in! It was good to hear you can focus solely on it before adding a heap of content! Hi! I’ve been looking for such an article for quite a long time! I’m really glad to have tripped over your post! I’ll definitely give those pieces of advice a try! Thank you! Hi, Nina! I’m so happy to hear my post was what you were looking for in order to build your email list and I appreciate your kind words! I hope you find it to be useful as you work on growing your blog. Please keep me updated on the progress you see when implementing these steps or if you have any questions along the way! I can’t agree more with the FB group promos, there is so much free traffic on those little groups. But i don’t know if it would work for all niches. Great tip though. Thank you! I am in the process of setting up a Landing page for my new resource library. I needed to hear that I am on the right track focusing on subscribers. Great post! You’re so welcome, Cheree! I’m so glad you found this post helpful. You got this! Ok, I feel like I’ve read A LOT of advice on growing your email list, but from a marketing ‘strategy’ standpoint, this is genius! Thank you so much for the advice you give on all this!! This was soooo helpful for me! Thanks for sharing your email list tips, I’m going to work on this right away. Hi Laura! I’m so glad you found the post so helpful and look forward to hearing how it’s helped grow your list. 🙂 Thank you for commenting!